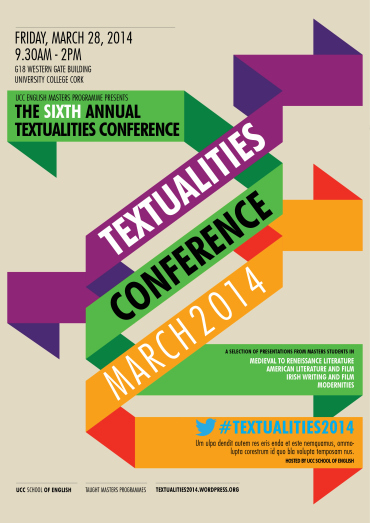 Welcome to the homepage for University College Cork’s Textualities Conference 2014, where students from a range of disciplines within the School of English will showcase their work. The conference will take place on Friday the 28th of March in The Western Gateway Building room G18 from 9.30am-3.00pm. Disciplines that will be seen on the day include American Literature and Film, Irish Writing and Film, Modernities: Romanticism, Modernism, Postmodernism and Texts and Contexts: Medieval to Renaissance Literature. I will be presenting at this fine, student-run conference.